For the past 10 years, Scottish Home Improvements has served locally as the top Englewood siding replacement experts, committed to providing Englewood residents with the superior quality home exteriors that they need to fight the harsh winter hailstorms and snows that the Englewood area and the rest of Colorado are known for. With the right quality and type of materials, you can reap the benefits of lower energy bills, fewer maintenance problems, and better insulation for your Englewood home as a result of your Scottish Home Improvements siding installation. Scottish Home Improvements has been a favorite choice for Englewood homeowners who like to deal with local Englewood siding replacement experts who have the highest customer service rating in the business. Learn more about the various siding replacement and siding repair services we offer, as well as the siding products available through Scottish Home Improvements below. Many homeowners have discovered James Hardie® Fiber Cement Siding, which is offered by Scottish Home Improvements. This type of siding will outlast other siding products time and time again, particularly in terms of the aesthetic longevity. Fiber cement James Hardie siding also offers Englewood properties excellent protection from the elements, which will help to lower your long term maintenance costs. Additionally, James Hardie siding has an excellent warranty to help protect your investment. To demonstrate how well the high quality fiber cement James Hardie siding works for Englewood homes, Scottish Home Improvements will happily provide you with a list of local addresses where you can see why this low maintenance siding option has become a popular siding choice for Englewood homeowners. 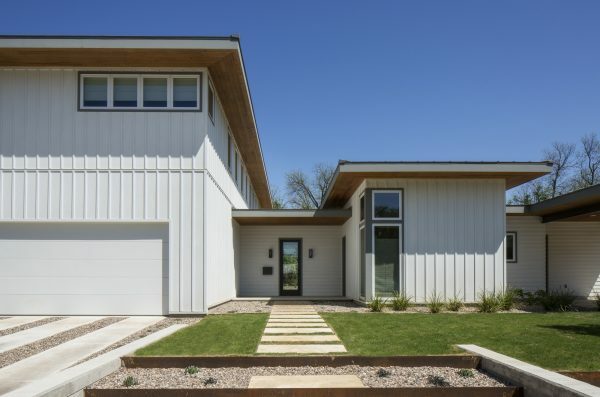 While we highly recommend fiber cement as one of the many James Hardie siding options for Englewood properties, we offer many other siding options that can be tailored to the needs of your home or business, outlined in detail below. James Hardie® VerticalPanel stucco-styled siding panels are becoming more and more popular in Englewood. This beautiful and low maintenance option looks like regular stucco but without the maintenance. Discover how these types of siding options improve your Englewood home’s appearance with the help of the Scottish Home Improvements’ unique exterior visualization tool. Using cutting-edge computer technology, we take photographs of your home and show you how it will look after your new siding is installed. Scottish Home Improvements can provide a range of steel siding options for your Englewood home or business. Steel siding is a lower priced and durable option which can protect your home or commercial building from the elements while requiring very little in the way of maintenance. If you’re looking to renovate your home or property on a budget, vinyl siding can be an excellent choice. We partner with Alside to provide Englewood homeowners with high quality vinyl siding that looks beautiful and lasts over the years. Wood and cedar siding have always been a popular choice for homes in the Englewood area because of their natural beauty. Wood siding is rich in color and texture and is perfect for Englewood’s mountain backdrop. At Scottish Home Improvements, we offer both natural wood siding and LP SmartSide engineered wood siding. Stone siding makes a beautiful addition to Englewood homes and can be used as a primary material or as an accent. At Scottish Home Improvements, we’ve partnered up with Sunset Stone to provide our clients with the finest natural stone siding existing on the market. Versatile and alluring, Sunset Stone siding looks beautiful on nearly any type of home, ranging from historic properties to more modern architectural styles. Beyond the array of siding options listed above that available through Scottish Home Improvements, our team of home improvement experts also specializes in siding repair for Englewood-area homes and businesses. A fantastic option for business- and homeowners alike looking to work within a budget or who are interested in matching the current exterior of their property, siding repair protects Englewood properties even as it adds to their outward appeal. Our Englewood showroom is open 6 days a week, meaning that you can check out our vast selection of siding products at the time that works best for your busy schedule. We also offer free and convenient in-home consultation appointments every day, including weekends and evenings. Get started on the process of protecting and beautifying your home by calling us today to schedule your no-cost consultation!